6/2016 - Nature Methods highlights Victor’s paper with article titled “PCR for cellular forces”! 5/2016 - First T cell receptor tension sensor is highlighted by Chemical & Engineering News and by Emory Science Commons!! 5/2016 - Watch 2 min youtube interview describing our latest results studying T cell mechanics! 4/2016 - Roxanne Glazier receives the NSF Graduate Research Fellowship!! Aaron Blanchard receives honorable mention!! 4/2016 - Yang Liu’s paper on T-cell mechanics is accepted in PNAS! 4/2016 - First example of catalytic amplification to readout piconewton forces. Victor’s paper appears in Angewandte Chemie! 1/2016 - First example showing the use of catalytic nanoparticles for treatment of acute inflammation in heart disease! Paper appears in Biomaterials! 11/2015 - Kornelia’s paper accepted in Nano Letters! 10/2015 - We are on a roll - Zheng’s & Yang’s paper is accepted in Nature Methods! 9/2015 - Jessica Petree receives ARCS fellowshipand Kornelia Galior receives the Quayle award! Good job! 8/2015 - Kevin’s paper is accepted in Nature Nanotechnology! Stay tuned! 8/2015 - Daniel Stabley’s much anticipated real-time TIRF nanometry paper is now accepted in Nature Communications! Congratulations! 8/2015 - Dr. Weiwei Zheng moves to Syracuse University to start as an Assistant Professor of Chemistry. Best of Luck! We will miss you! 8/2015 - Lab goes on an extreme zip lining trip. We’ll post some pictures soon. 7/2015 - Congratulation to Dr. Kevin Yehl on an excellent thesis defense! 5/2015 - Carol’s review article is published in Molecular and Cellular Biology! 5/2015 - Yun Zhang wins a best poster prize at the GRC on Fibronectin, Integrins & Related Molecules in Italy. Nice work! 5/2015 - Khalid receives an NIGMS equipment supplement to acquire a multicolor Fluorescence Lifetime Imaging Microscope (FLIM) system. 4/2015 - Josh Brockman receives NSF Graduate Research Fellowship and Jessica Petree receives honorable mention! Congratulations! 1/2015- Hanquan Su joins the lab! yay! 9/2014 - Josh Brockman and Roxanne Glazier (BME program) join the lab! WELCOME and best of luck! 9/2014 - Yang’s paper on patterned tension sensors is accepted in Nano Letters! Congrats! 9/2014 - Yun’s paper on DNA-based tension probes is accepted in Nature Communications! High five! Work also featured in Nature Reviews Molecular and Cell Biology and Chemical & Engineering News! 5/2014- Khalid receives the Camille Dreyfus Teacher-Scholar Award!! 2/2014 - Lab welcomes three new graduate students: Jessica Petree, Mingda Zhang, and Victor Pui-Yan Ma! 1/2014 - NSF-CAREER, NSF-IDBR, and NSF-EAGER proposals are all recommended for funding! Nice work team! 1/2014 - Carol’s paper, “Integrin Generated Forces Lead to Streptavidin-Biotin Unbinding in Cellular Adhesions" is now accepted in Biophysical Journal! Congratulations! 1/2014 - Weiwei Zheng’s paper "Quantum dots encapsulated within phospholipid membranes: phase-dependent structure, photostability, and site-selective functionalization" is now in JACS!! 12/2013 - The first Atlanta Area Molecular and Cellular Biophysics Symposium was a huge success! Over 170 attendees! Special thanks to the group for all their help! 3/2013 - Kevin Yehl receives NSF EAPSI award!! 3/2013 - Yoshie Narui selected to attend the 2013 Lindau Nobel Laureate Meeting in Germany!! 2/2013 - Khalid selected as a 2013 Alfred P. Sloan Research Fellow! 2/2013 - Daniel’s paper in Integrative Biology is highlighted on the back cover! 2/2013 - Daniel’s paper is accepted in Integrative Biology! Congratulations! 12/2012 - Proposal for Nanoscience Research Program at the Center for Nanophase Materials Sciences (CNMS) is approved to support Yoshie’s project. 11/2012 - Charlene’s work is highlighted on the cover of the Journal of Chemical Education. 9/2012 - Kevin’s paper appears in ACS Nano! Congratulations! 9/2012 - Carol and Daniel are headed to Washington DC as finalists for 2012 Collegiate Inventor’s Competition!! 8/2012 - Charlene’s manuscript appears in the Journal of Chemical Education! Congrats! 4/2012 - Weiwei Zheng joins the lab as a postdoc after completing his Ph.D. from FSU --Welcome to the Salaita lab!!! Also congrats to Weiwei for winning best thesis award. 4/2012 - Lab receives R01 grant from NIH-NIGMS !!! 2/2012 - Lab receives seed grant through the NIH-NHLBI Program of Excellence in Nanotechnology (PEN) center. 2/2012 - Welcome to Yun Zhang and Yuan Chang who have joined the lab as first year graduate students. 12/2012 - Work from the lab listed as one of the top ten science stories of 2011 at Emory. 12/2012 - Group research highlighted in Chemical & Engineering News. 11/2011 - Daniel Stabley, Carol Schumacher, and Stephen Marshall's paper appears in Nature Methods!! Congrats! October 2011- Charlene Chan's Mole Day pinata highlighted at eScienceCommons. Fun! May 2011 - Congratulations to Charlene Chan for winning the 2011 William Jones Scholarship!!! April 2011 - Congratulations to Charlene Chan for winning the Undergraduate Poster Award and to Deep Chandegara for winning the Hypercube Outstanding Physical Chemistry Student award!! March 2011 - Come see Charlene and Khalid give talks at Spring ACS meeting in Anaheim, CA. March 2011 - Congrats to Charlene Chan for winning Chemistry Department ACS travel award!! February 2011 - Welcome Yang Liu as a first year graduate student in the lab!!! December 2010 - Come see Kevin Yehl and Khalid Salaita give talks at the 2010 SERMACS Meeting in New Orleans! 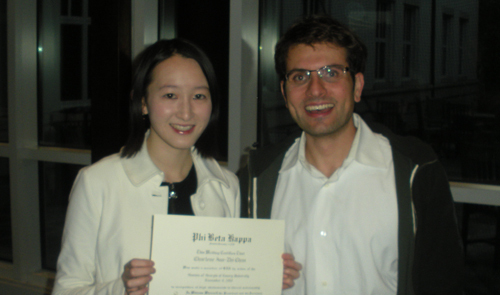 October 2010 - Congrats to Charlene Chan and Kevin Harrell on being accepted into Phi Kappa Beta (photos). October 2010 - Yoshie (photos) and Daniel (photos) give posters at Winship Cancer Institute Research Symposium. August 2010 - Congratulations to Kevin Yehl for GAANN Graduate Student Fellowship!! August 2010 - Welcome Carol Schumacher as a grad student into the lab! July 2010 - Charlene Chan and Stephen Marshall awarded independent research grantsfrom SIRE !!! May 2010 - Welcome Yoshie Narui and Stephen Marshall to the lab!!! April 2010 - Khalid Salaita receives a Cancer Research Award from the Georgia Cancer Coalition. March 2010 - Kevin Harrell receives a SURE award to conduct summer research. Congratulations Kevin!! March 2010 - Khalid gives seminar to Emory School of Medicine Division of Digestive Diseases . March 2010 - Manuscript appear in Science along with a Perspective article!!! March 2010 - Nscriptor DPN System arriving into our lab! March 2010 - Come see Daniel Stabley's presentation at the Spring ACS meeting in San Francisco! February 2010 - Khalid gives Winship Cancer Institute Elkin Seminar. February 2010 - Welcome Kevin Yehl into the lab!! !